Brookfield, Wis. – W. Ashley Cozine, MBA, CFSP, CPC, CCO, of Cozine Memorial Group in Wichita, Kan., has been appointed to the 2018-19 National Funeral Directors Association (NFDA) Spokesperson Team. Members of the NFDA Spokesperson Team are called upon to speak on behalf of the Association to media representatives and other audiences, providing insight and expertise on the importance of meaningful funeral and memorial services and the services funeral professionals provide to the grieving families every day. NFDA is the world's leading and largest funeral service association, serving more than 20,000 individual members who represent nearly 11,000 funeral homes in the United States and 49 countries around the world. NFDA is the trusted leader, beacon for ethics and the strongest advocate for the profession. NFDA is the association of choice because it offers funeral professionals comprehensive educational resources, tools to manage successful businesses, guidance to become pillars in their communities and the expertise to foster future generations of funeral professionals. NFDA is headquartered in Brookfield, Wis., and has an office in Washington, D.C. For more information, visit www.nfda.org. Brookfield, Wis. – W. Ashley Cozine, MBA, CFSP, CPC, CCO, of Cozine Memorial Group in Wichita, Kan., has been appointed to chair the National Funeral Directors Association (NFDA) 2018-19 Leadership Development Committee. Members of the NFDA’s Leadership Development Committee help recruit, vet and recommend qualified candidates for elected positions on the Board of Directors. They will ensure candidates have the skills, knowledge and abilities necessary to serve as leaders of NFDA based on established criteria. The committee will also help ensure all candidates adhere to campaign and election rules and, as needed, recommend changes to those guidelines. Brookfield, WI – W. Ashley Cozine of Cozine Memorial Group in Wichita, KS has been appointed as the Chairman of the 2018-2019 National Funeral Directors Association (NFDA) Advocacy Committee. The NFDA Advocacy Committee is responsible for identifying, discussing, and recommending federal legislative and regulatory issues to the NFDA Board of Directors that support and advance NFDA’s mission and vision. Members of the Advocacy Committee are highly visible leaders in the profession and are expected to promote NFDA’s advocacy efforts as well as NFDA’s Political Action Committee (PAC). Wichita, Kansas – Cozine Memorial Group has been honored with the Pursuit of Excellence Award at the 2018 NFDA International Convention & Expo, held October 14-17, 2018 in Salt Lake City, Utah. Only 159 firms from around the world received this prestigious recognition, placing Cozine Memorial Group among an elite group of funeral service providers. Pursuit of Excellence Award recipients raise the bar on funeral service excellence by adhering to the highest ethical and professional standards and providing unsurpassed service to families and communities. This year marks the fourteenth time Cozine Memorial Group has been recognized with the Pursuit of Excellence Award. On August 4, 1943, Lieutenant Irvin Rink was tragically killed when his naval plane was shot down by enemy fire over the Solomon Islands. Nearly sixty-five years later, American scuba diver, Mark Roche, discovered the plane wreckage and notified local authorities. It was another ten years before the remains were identified as that of Lieutenant Rink and plans were made to finally bring him home. The remains of Lieutenant Rink arrived at Dwight D. Eisenhower National Airport in Wichita, Kansas on April 7, 2018. He was met with a full US Navy Honor Guard detail and escorted to Broadway Mortuary by members of the Patriot Guard. Following cremation, the memorial services took place on April 16, 2018 at our mortuary chapel. The service was officiated by Rev. Brent Warkentine and focused on the great sacrifice Lieutenant Rink and others made during World War II and the importance of supporting the veterans’ of our country, both past and present. The service concluded with remarks from Mark Roche, the scuba diver who discovered the plane wreckage. Following the service, the remains of Lieutenant Rink were escorted to his final resting place by the Patriot Guard, several first responders and numerous law enforcement agencies. With over 300 community members in attendance, the procession took more than an hour, often times being slowed down by the numerous citizens lining the street to pay their respects. Wichita, Kansas – Dan Welch, CCO, CFSP, was recently elected as the Chair for the Young Professional’s Council for the Make-A-Wish Kansas Chapter. Dan has been actively involved with the Make-A-Wish Foundation for two years, and is greatly honored to take on the additional roles of leadership, guiding a council consisting of twelve other members. The mission of Make-A-Wish is to grant the wishes of children with life-threatening medical conditions, to enrich the human experience with hope, strength and joy and to make every eligible child's wish come true. Wichita, KS – Cozine Memorial Group has been honored with the Pursuit of Excellence Award at the 2017 NFDA International Convention & Expo, held October 28-November 1, 2017 in Boston, Massachusetts. Only 165 firms from around the world received this prestigious recognition, placing Cozine Memorial Group among an elite group of funeral service providers. Pursuit of Excellence Award recipients raise the bar on funeral service excellence by adhering to the highest ethical and professional standards and providing unsurpassed service to families and communities. Mulvane, KS – At its Fall District Meeting, held September 12 in Mulvane, Kansas, Dan Welch of Cozine Memorial Group was elected to serve on the Board of Directors for the Kansas Funeral Directors Association. He had previously been serving as the President of District Four of the Kansas Funeral Directors Association. The mission of the Kansas Funeral Directors Association is to cultivate and promote the art and science of the funeral service profession; to elevate and sustain the professional character and education of funeral directors and embalmers; to promote communications, good will and mutual improvements; to protect the health and welfare of the general public; to encourage the enacting and enforcing of proper and just law relative to funeral and burial practices within the State; to represent and safeguard the common interests of its members and to foster and maintain among them high professional ideals and ethics. Mr. Welch is a first-generation funeral director and embalmer. He is a 2011 graduate of the Dallas Institute of Funeral Service and has been recognized by the Academy of Professional Funeral Service Practice as a Certified Funeral Service Practitioner (CFSP). Wichita, Kansas – Cozine Memorial Group was recently voted as the “Best Funeral Home” in Wichita for the 2017 Reader’s Choice Awards, hosted by the Wichita Eagle Newspaper. The Reader’s Choice competition is a popular-vote based poll open to the general public. It is Wichita’s largest and most established contest. Voting took place from July 21--August 14. People voted online or by filling out special paper ballots, making it more secure and validating the results. The highly anticipated winners and favorites were announced in a supplement in the Wichita Eagle, published on September 22, 2017. Washington, DC – Members of the National Funeral Directors Association (NFDA) met in the nation’s capital for its annual Advocacy Summit on August 26-28, 2017. Delegations from states in attendance met with their senators and representatives to discuss advancing legislation that seeks to increase funeral and burial benefits for certain veterans. They also discussed legislation that effects small businesses and the bereaved. 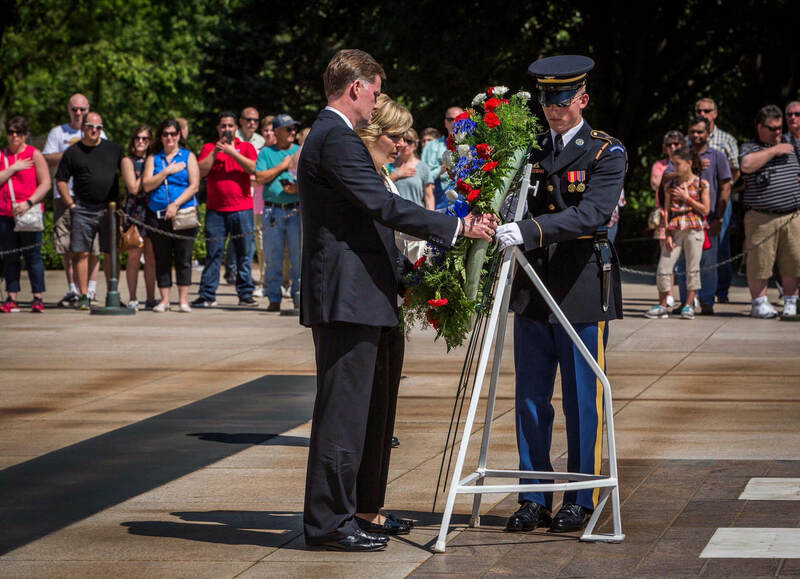 The final day of the Summit, attendees participated in a special tour of Arlington National Cemetery where NFDA President Ashley Cozine and his wife, Carolyn, laid a wreath at the Tomb of the Unknown Soldier on behalf of all NFDA members. Brookfield, Wis. – W. Ashley Cozine, CFSP, CPC, CCO, was recently named president of the National Funeral Directors Association (NFDA) during the 2016 International Convention & Expo, held October 23-26th in Philadelphia, Penn. Cozine is president of Cozine Memorial Group in Wichita, Kan., with locations at Broadway Mortuary and Kensington Gardens cemetery. Cozine is the only funeral director from Wichita – and only the fourth from Kansas – to serve as president in the NFDA’s 135-year history. He has served on the Kansas Funeral Directors Association (KFDA) Board of Directors, which included a term as KFDA president. In 2009, he was named the Kansas Funeral Director of the Year. He has also served on a number of NFDA committees as well as on the NFDA’s Board of Directors in several roles, including at-large representative, secretary, treasurer, and president-elect. Under Cozine’s leadership, Cozine Memorial Group has been recognized multiple times by NFDA with the Pursuit of Excellence Award, an award presented to firms that exemplify a commitment to excellence and outstanding service to others. In 2014, Cozine Memorial Group was inducted into the NFDA Hall of Excellence after receiving a 10th Pursuit of Excellence Award. NFDA is the world’s leading and largest funeral service association, serving nearly 20,000 individual members who represent more than 10,000 funeral homes in the United States and 49 countries around the world. NFDA is the trusted leader, beacon for ethics and the strongest advocate for the profession. NFDA is the association of choice because it offers funeral professionals comprehensive educational resources, tools, to manage successful businesses, guidance to become pillars in their communities and the expertise to foster future generations of funeral professionals. NFDA is headquartered in Brookfield, Wis., and has an office in Washington, D.C. For more information, visit www.nfda.org. Wichita, KS – Cozine Memorial Group has been honored by the National Funeral Directors Association (NFDA) with the 2016 Pursuit of Excellence Award. Just over 160 firms from around the world received this prestigious recognition, placing Cozine Memorial Group among an elite group of funeral service providers. Pursuit of Excellence Award recipients raise the bar on funeral service excellence by adhering to the highest ethical and professional standards and providing unsurpassed service to families and communities. Wichita, KS…The National Funeral Directors Association (NFDA) has renewed the nationally recognized Certified Preplanning Consultant (CPC) designation to W. Ashley Cozine of Cozine Memorial Group. The CPC certification program is considered the standard of excellence in funeral service for individuals who help families plan funerals in advance. In order to become a Certified Preplanning Consultant, candidates must meet specific program requirements and pass an examination based on a standards manual. CPCs must demonstrate their ongoing professional commitment by fulfilling specific requirements as they renew their certification every four years. NFDA’s Certified Preplanning Consultant program, established in 1997, recognizes qualified, knowledgeable individuals who are committed to provide ethical and caring advance planning services for all families. “Those who have earned the CPC designation have achieved a unique career distinction that is highly valued by families that want to plan meaningful funerals in advance,” according to Colleen Murphy Klein, who manages the program. NFDA is the world’s leading and largest funeral service association, serving 19,700 individual members who represent nearly 10,000 funeral homes in the United States and 39 countries around the world. NFDA is the trusted leader, beacon for ethics, and the strongest advocate for the profession. NFDA is the association of choice because it offers funeral professionals comprehensive educational resources, tools to manage successful businesses, guidance to become pillars in their communities and the expertise to foster future generations of funeral professionals. NFDA is headquartered in Brookfield, Wis., and has an office in Washington, D.C. For more information, visit www.nfda.org. Overland Park, KS – William L. “Bill” Cozine was recognized for his 50 years of service to the funeral profession by the Kansas Funeral Directors Association (KFDA) at the Tri-State Convention (Kansas, Missouri and Nebraska) in Overland Park, Kansas on May 10, 2016. Cozine, a second generation funeral director, is the co-owner of Cozine Memorial Group in Wichita.  The company operates Broadway Mortuary and Kensington Gardens cemetery. Bill was appointed to the Kansas State Board of Mortuary Arts (a regulatory and licensee board) by Governor Sam Brownback. He is currently in his second term and serves as the Board’s President. 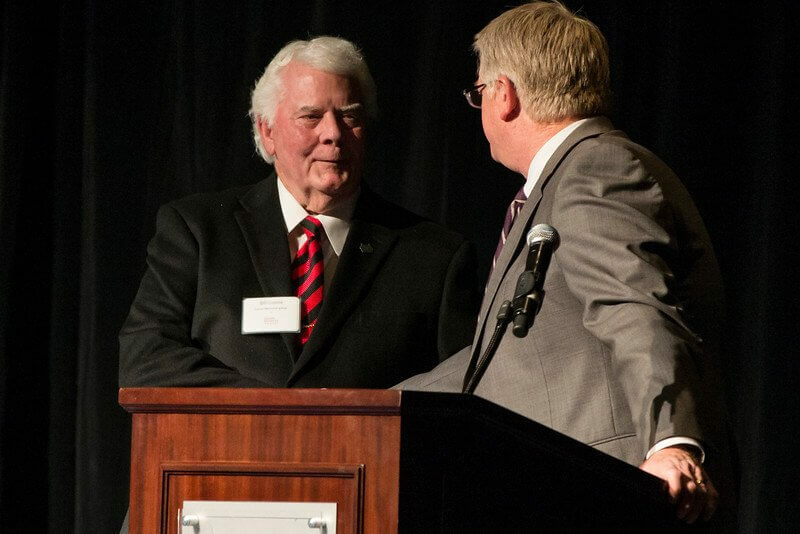 “It has been a true privilege to serve Wichita and Kansas families over these past 50 years,” he said. A life verse that has guided Bill in his service to others is Col. 3:23. WICHITA, KAN – Cozine Memorial Group, in conjunction with the Funeral and Memorial Information Council (FAMIC), recently launched their Have the Talk of a Lifetime campaign, a public education initiative that offers practical tools and advice to help families have important conversations, including how they hope to be remembered when they pass away. According to a 2015 national online survey conducted by Harris Poll, of the 1,238 U.S. adults aged 40 and older, 69 percent indicated they would prefer to pre-arrange their own service; however, only 17 percent had made arrangements. The study also revealed that an overwhelming majority believed a service they had attended was helpful in commemorating the life of a friend or family member (82%); had value, meaning and reflected the life of the deceased (80%); and, was an important part of the healing process (72%). Families can find a wide range of free tools and information to help them the start the talk of a lifetime with their loved ones on the campaign website, www.talkofalifetime.org. In addition to several educational videos and a downloadable workbook filled with advice on how to start a conversation — the site also offers questions to help families get to know their loved ones in new and surprising ways. There’s even a blog for people to share their experiences about what worked for them and how it made an impact. Learn more about Have the Talk of a Lifetime by visiting www.talkofalifetime.org. 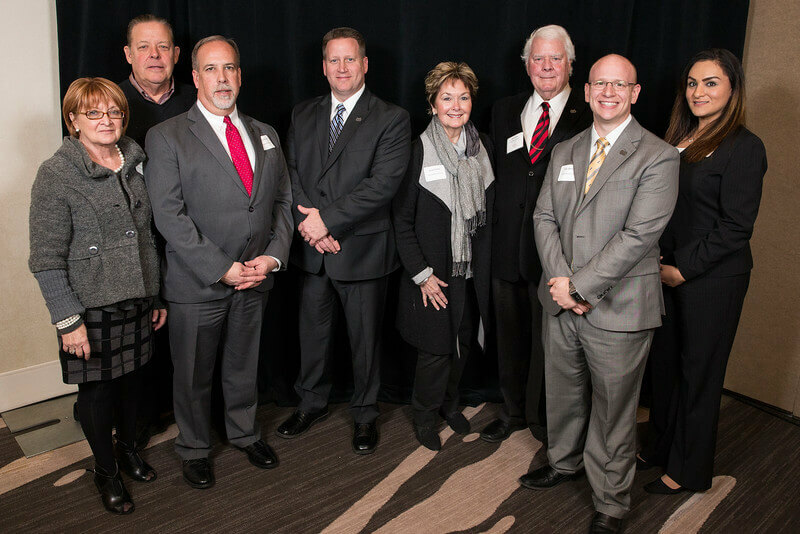 Wichita, Kansas – Cozine Memorial Group was one of 15 companies and families to be honored for its longevity of service to the Wichita community at the Wichita Business Journal’s inaugural Family Business Awards. The event was held at the Hyatt Regency Wichita on January 21, 2016. “These leaders and companies helped shape Wichita, and that’s why we created the Family Business Awards,” said Bill Roy, editor of the Wichita Business Journal. “These companies deserve our thanks, and we’re glad to provide the opportunity to recognize them for their commitment to Wichita,” added Roy. W. Ashley Cozine, CFSP and William L. “Bill” Cozine, CFSP of Cozine Memorial Group in Wichita, Kansas have recently qualified for recertification of the designation of Certified Funeral Service Practitioner (CFSP), by the Academy of Professional Funeral Service Practice. W. Ashley Cozine, CFSP serves as Ambassador for the Academy. A select few have distinguished themselves among their peers within the funeral service profession as they continue their education to exceed the highest standards in care. This achievement is especially notable because Ashley and Bill have voluntarily elected to participate in quality educational and service opportunities that far surpass what the funeral service licensing board in Kansas requires. Ashley and Bill have committed to a program of lifelong learning to serve the families in the Wichita community with a level of excellence expected of a CFSP. Since its 1976 founding, the Academy as had as its goals: 1) to recognize those practitioners who have voluntarily entered into a program of personal and professional growth, 2) to raise and improve the standards of funeral service and 3) to encourage practitioners to make continuing education a life-long process in their own self-interest, the interest of the families they serve and the community in which they serve. To initially receive this award, the practitioner must complete a 180 hour program of continuing education activities and events. In addition, the practitioner is required to accumulate 20 hours per year to recertify. Credits are awarded by the Academy for work leading to personal and/or professional growth. For additional information about the Academy, visit www.apfsp.org. Wichita, KS – Cozine Memorial Group hosted the National Funeral Directors Association’s (NFDA) Certified Crematory Operator program on November 17, 2015 at the First Church of the Nazarene in Wichita, Kansas. The program was attended by the staff of Cozine Memorial Group as well as participants from Kansas, Missouri, Nebraska, Oklahoma and Alaska. The program is the recognized standard for funeral service professionals and covers cremation ethics, crematory operations and maintenance, safety, compliance and liability issues, cremation customer service and much more. Mike Nicodemus, NFDA Vice President of Cremation Services was the presenter. Wichita, KS – R. Glen McPherron of Cozine Memorial Group was recently appointed to serve on the South Central Kansas Preparedness Healthcare Coalition (SCKPHCC) Executive Committee. He will represent the Kansas Funeral Directors Association (KFDA) in this position. The purpose of the SCKPHCC is to bring together a multiagency and multidisciplinary group of entities and individuals working together to promote, consolidate and collaborate in a unified response to emergencies affecting the Region. The intent of the SCKPHCC is to enhance the Region’s ability to achieve emergency preparedness capabilities as recommended by the U.S Department of Health and Human Services and the Centers for Disease Control and Prevention. The mission of the SCKPHCC is to promote and to enhance the emergency preparedness and response capabilities of healthcare entities through: building relationships and partnerships; facilitating communication, information and resource sharing; promoting situation awareness among SCKPHCC members; coordinating training, drills and exercises; strengthening medical surge capacity and capabilities; assisting emergency management and Emergency Support Function (ESF) #8 partners; and maximizing movement and utilization of existing resources. Mr. McPherron has served on the KFDA Disaster Committee for the past several years. His term on the SCKPHCC Executive Committee will begin January 1, 2016. Wichita, KS – Cozine Memorial Group has been honored by the National Funeral Directors Association (NFDA) with the 2015 Pursuit of Excellence Award. Only 155 firms from around the world received this prestigious recognition, placing Cozine Memorial Group among an elite group of funeral service providers. Pursuit of Excellence Award recipients raise the bar on funeral service excellence by adhering to the highest ethical and professional standards and providing unsurpassed service to families and communities. NFDA is the world’s leading and largest funeral service association, serving 19,700 individual members who represent more than 10,000 funeral homes in the United States and 39 countries around the world. NFDA is the trusted leader, beacon for ethics and the strongest advocate for the profession. NFDA is the association of choice because it offers funeral professionals comprehensive educational resources, tools to manage successful businesses, guidance to become pillars in their communities and the expertise to foster future generations of funeral professionals. NFDA is headquartered in Brookfield, Wis., and has an office in Washington, D.C. For more information, visit www.nfda.org. Brookfield, Wis. – During its 2015 International Convention & Expo, held October 18-21 in Indianapolis, Indiana, the National Funeral Directors Association (NFDA) elected and installed W. Ashley Cozine, CFSP, CPC, CCO, as president-elect. Cozine is a third-generation funeral director with his family’s firm, Cozine Memorial Group in Wichita, Kansas. Cozine has served his profession at both the state and national level. As a member of the Kansas Funeral Directors Association (KFDA) he served in every position on the association’s board of directors, including a term as president. He has also served on the following KFDA committees: Convention, Legislative, Nominating, and Young Professionals. In 2009, he earned the Funeral Director of the Year Award. On a national level, Cozine has served as an at-large representative, secretary and treasurer on the NFDA Board of Directors. He formerly was Kansas’ representative to the NFDA Policy Board. In addition, he has served on a number of NFDA committees including: Spokesperson Team; Professional Development; National-State Relations; Federated Insurance Safety & Risk Management Advisory Group and Member Resources Advisory Group. He is a member of the Heritage Club and Cozine Memorial Group is an active participant in the Pursuit of Excellence Award program. Wichita, KS – At its Fall District Meeting, held September 2 in Wichita, Dan Welch of Cozine Memorial Group was elected to serve as the Secretary-Treasurer of District Four of the Kansas Funeral Directors Association. Mr. Welch is a first-generation funeral director and embalmer. He is a 2011 graduate of the Dallas Institute of Funeral Service. Earlier this year, he participated in the National Funeral Directors Association’s “Meet the Mentors” program. Topeka, KS – Governor Sam Brownback has appointed William L. “Bill” Cozine, Wichita, to a second term on the Kansas State Board of Mortuary Arts (KSBMA). Mr. Cozine’s term will expire July 31, 2018. At their meeting of July 9, 2015, the Kansas State Board of Mortuary Arts elected Mr. Cozine as their President. Mr. Cozine earned a BA in Political Science at Wichita State University, attended Washburn Law School and graduated with honors from the Dallas Institute of Mortuary Science. He is a licensed embalmer, funeral director and crematory operator and has been actively involved in the ownership and direction of Broadway Mortuary in Wichita since 1964. He and his son, Ashley, who is currently serving as Treasurer for the National Funeral Directors Association, also own and operate Kensington Gardens Cemetery and Crematory. Bill has been recognized as a Certified Funeral Service Practitioner (CFSP) by the Academy of Professional Funeral Service Practice (one of only ten in the State of Kansas) and has been involved in all phases of service to families. Additionally, Bill is recognized by the National Funeral Directors Association as a Certified Cremation Operator (CCO). He is a member of the Kansas Funeral Directors Association, as well as the National Funeral Directors Association. Bill currently serves on the Advisory Board for the Salvation Army and is a member of Wichita Downtown Rotary and the Wichita Metro Chamber of Commerce. He and his wife of 52 years, Suzy, attend Central Christian Church in Wichita and are the parents of two children. They have eight grandchildren. The mission of the Kansas State Board of Mortuary Arts is to ensure that licensees perform their professional services in a manner providing maximum protection of the health, safety and welfare for consumers. The agency also informs the public of laws and options available to them when utilizing the services of funeral licensees. Wichita, KS – Daniel C. Welch of Cozine Memorial Group in Wichita, Kansas was one of 50 funeral directors nationwide selected to participate in the National Funeral Directors Association’s (NFDA) Meet the Mentors program. Meet the Mentors is supported by the Funeral Service Foundation. Meet the Mentors, which took place March 16-18 at the Emory Conference Center Hotel in Atlanta, Ga., brought young funeral professionals together to learn from four of the country’s leading funeral directors and network with like-minded peers. During the program, each mentor gave a presentation in which they shared lessons they have learned about how to build a successful and fulfilling career in funeral service. After the presentations, there was a panel discussion followed by small group discussions with each mentor. Mr. Welch began his career in funeral service in 2009. After graduating from Dallas Institute of Funeral Service in 2011, he returned to Wichita and became a Kansas licensed Funeral Director and Embalmer. The families that he serves are always grateful for his kind, gentle and helpful manner. Cozine Memorial Group is very proud to have Dan as a part of its team and to have the privilege of working with him on a daily basis. “We are very excited that Dan was able to have participated in this year’s Meet the Mentors program. It is an excellent learning opportunity and we fully expect him to bring back some great ideas that we can put into practice,” said W. Ashley Cozine. Wichita, KS – Mr. Mark Sloyer, a member of Cozine Memorial Group, participated as part of the local host group for the International Shrine Clown Association’s (ISCA) Mid-Winter Convention (Clown Competition), held in Wichita at the Airport Best Western Hotel on February 25-28. Clowns from all over the globe came together to compete over the 4-day event. They exchanged ideas on costumes, makeup, skits and more. Mark has enjoyed clowning for many years and has brought joy and delight to seniors and youngsters alike as he has visited nursing homes, children’s homes, Shrine hospitals and local hospitals. He is known as a Tramp clown. Mark’s mentor, also a tramp clown, was none other than the “world’s most famous clown” – Mr. Emmett Kelly, Jr. Mr. Kelly spent time with Mark showing him some of his tricks of the trade. They developed a fast friendship and before Emmett passed away he gave Mark several personal items from his various collections. You will be pleased to know that we have asked Mark not to clown around while at work. Brookfield, Wis. – During its 2014 International Convention & Expo, held in last month in Nashville, Tenn., the National Funeral Directors Association (NFDA) elected and installed W. Ashley Cozine, CFSP, CPC, CCO, as treasurer. Cozine is a third-generation funeral director with his family’s firm, Cozine Memorial Group. As treasurer, Cozine will be responsible for all funds, securities, deeds and other assets belonging to NFDA, while overseeing all business-related transactions. He will recommend changes to NFDA’s investment policy, report on the Association’s finances to the Executive Board, Policy Board and House of Delegates, and meet with external auditors on an as-needed basis. Cozine will represent NFDA and its mission at state funeral association conventions, and serve on several committees and subcommittees. Cozine is Kansas’ former representative to the NFDA Policy Board. He has served on a number of NFDA committees including: Spokesperson Team; Professional Development; National-State Relations; Federated Insurance Safety & Risk Management Advisory Group and Member Resources Advisory Group. He is a member of the Heritage Club and Broadway Mortuary is an active participant in the Pursuit of Excellence Award program. Cozine Memorial Group was recently honored by the National Funeral Directors Association (NFDA) with the 2014 Pursuit of Excellence. Only 151 firms from around the world received this prestigious recognition, placing Cozine Memorial Group among an elite group of funeral service professionals. Pursuit of Excellence Award recipients raise the bar of funeral service excellence by adhering to the highest ethical and professional standards and providing unsurpassed service to families and communities. In addition to receiving the 2014 NFDA Pursuit of Excellence Award, Cozine Memorial Group was inducted in the NFDA Hall of Excellence. 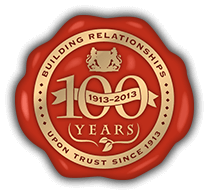 Created to recognize a consistent display of service excellence, NFDA-member funeral homes are inducted into the Hall of Excellence upon receiving their 10th Pursuit of Excellence Award. “It is a real honor to be once again recognized by NFDA as a Pursuit of Excellence Award recipient. This past year we celebrated our firm’s 100-year history of service to our community, so it means a lot to also be inducted into the NFDA Hall of Excellence,” said Cozine Memorial Group President W. Ashley Cozine. At their meeting of July 10, 2014, the Kansas State Board of Mortuary Arts elected William L. “Bill” Cozine, Wichita, as their Vice President. Kansas Governor Sam Brownback appointed Mr. Cozine as a board member to the Kansas State Board of Mortuary Arts for a term expiring July 31, 2015. He is a licensed embalmer, funeral director and crematory operator and has been actively involved in the ownership and direction of Broadway Mortuary in Wichita for more than 51 years. He and his son, Ashley, who is currently serving as Secretary for the National Funeral Directors Association, also own and operate Kensington Gardens Cemetery and Crematory. He has been recognized as a Certified Funeral Service Practitioner (CFSP) by the Academy of Funeral Service Practitioners (one of only ten in the State of Kansas) and has been involved in all phases of service to families. Additionally, Bill is recognized by the National Funeral Directors Association as a Certified Crematory Operator (CCO). He is a member of the Kansas Funeral Directors Association, as well as the National Funeral Directors Association. Bill currently serves on the Advisory Board for the Salvation Army and is a member of Wichita Downtown Rotary and the Wichita Metro Chamber of Commerce. He and his wife of 51 years, Suzy, attend Central Christian Church in Wichita and are the parents of two children. They have eight grandchildren. For more information, visit the KSBMA’s website: www.kansas.gov/ksbma or contact the board office at (785) 296-3980, 700 SW Jackson St., Suite 904, Topeka, KS 66603-3733. Brookfield, Wis. – During its 2013 International Convention & Expo, held in last month in Austin, Texas, the National Funeral Directors Association (NFDA) elected and installed W. Ashley Cozine, CFSP, CPC, CCO, as secretary. Cozine is a third-generation funeral director with his family’s firm, Broadway Mortuary. As secretary, Cozine will attend and record all Executive Board, Policy Board and House of Delegates meetings, ensuring that all documents and records are properly kept and filed. Cozine will also record all activities of the Executive Board at the annual NFDA International Convention & Expo, represent the association and its mission at state funeral service conventions, and serve as a member of several committees and subcommittees. Cozine has served his profession at both the state and national level. As a member of the Kansas Funeral Directors Association (KFDA) he served in every position on the association’s board of directors, including a term as president. He has also served on the following KFDA committees: Convention, Legislative, Nominating, and Young Professionals. In 2009, he was earned the Funeral Director of the Year Award. 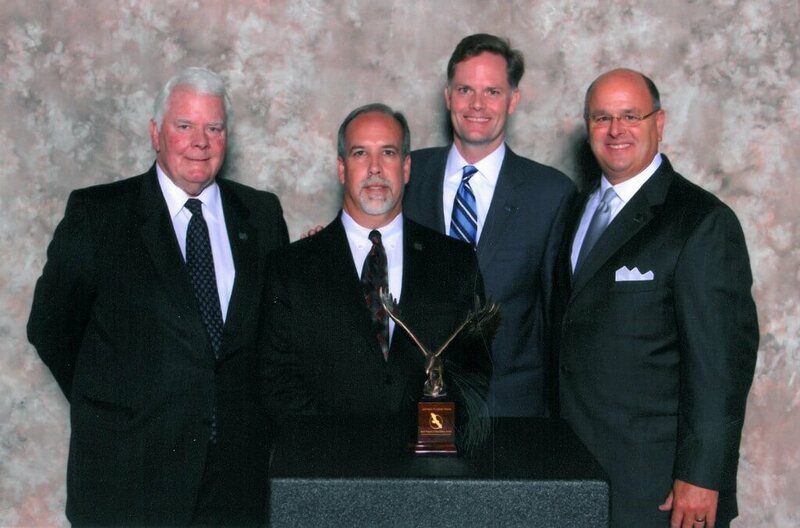 Wichita, KS – Cozine Memorial Group has been honored by the National Funeral Directors Association (NFDA) with the 2013 Pursuit of Excellence Award. Only 153 firms from around the world received this prestigious recognition, placing Cozine Memorial Group among an elite group of funeral service providers. Pursuit of Excellence Award recipients raise the bar on funeral service excellence by adhering to the highest ethical and professional standards and providing unsurpassed service to families and communities. Wichita, KS – William L. “Bill” Cozine, CFSP and W. Ashley Cozine, CFSP, CPC recently earned their Certified Crematory Operator (CCO) designation from the National Funeral Directors Association (NFDA). The NFDA Certified Crematory Operator Program is a voluntary certification program that helps funeral directors better serve the needs of families that desire cremation. Nationally, in 2012, 43.2 percent of people who died in the United States were cremated, up from 34.2 percent in 2007. As the cremation rate continues to increase, ensuring that funeral home and crematory staff are properly trained to meet the needs of families that choose cremation is of utmost importance. NFDA’s Certified Crematory Operator Program provides participants with instruction in best practices for safe, proper and ethical crematory operations and for excellence in service to families that choose cremation. Seminars cover the topics required by state law and are designed to develop understanding, skills and a broad working knowledge of proper operational procedures as well as required and prudent administrative procedures. Washington, DC - Ashley Cozine, president of Broadway Mortuary, is scheduled to testify today in front of the House Committee on Veterans’ Affairs Subcommittee on Disability Assistance and Memorial Affairs. Cozine, who is on the National Funeral Directors Association Executive Board, will express the group’s strong support for the “Veterans Missing in America Act of 2011.” Cozine is expected to discuss the results of a recent survey of NFDA members about their experiences with veterans’ cemeteries and the Department of Veterans’ Affairs. “Overall, our members were highly complementary of the state of our veteran’s cemeteries. We received an almost unanimous response that our nation’s national cemeteries operate efficiently, effectively, and with much compassion for those being buried there as well as their families,” he said in written testimony.